Nike Air Flightposite Mens Legion Green Basketball Shoes SIZE 10. Condition is New with box. Shipped with USPS Priority Mail. Nike Foamposite in Sea Island Green Mens Size 12 Basketball Shoes Rare Colors In excellent condition with only slight wear and a fee small scuffs. 8.5/10 ***These shoes have no insoles*** Shipped with USPS Priority Mail. Message me for more pics or to ask any questions. Thanks! nike foamposite size 10.5 Green. Condition is Pre-owned. Shipped with USPS Priority Mail. Nike Air Foamposite One Legion Green & Black GS Size 7Y 644791 301. Condition: Overall decent condition with a fresh protectant layer of Krylon Matte finish on the uppers to give them a unique matted holographic look. Nike Air Foamposite Legion Green Size9.5. Condition is Pre-owned. Shipped with USPS Priority Mail. 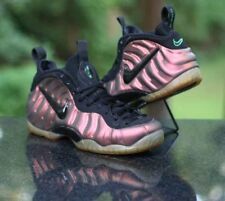 VNDS Nike Foamposite Pro Pine Green Black size 10. Condition is New with box. Shipped with USPS Priority Mail. Like New, Unworn Appearance! Iridescent Beetle Green/Gold Nike Blazer Foamposite size 8.5 Green /Ink Black 379416-700 EUC Please see photos for condition details and thanks for viewing my listings! NIKE Men’s Foamposite Green Pro Gym Sneaker Size 10.5 Good Condition With Box. Condition is Pre-owned. Shipped with USPS Priority Mail. This is a Nike Air Foamposite "Electric Green" in Very Good Condition. IN GOOD PRE-OWNED/USED CONDITION. THEY ARE ABOUT 5 1/2" TALL. Supreme Nike Foamposites Foam Sneakers Size 10.5 Mint Condition. This shoe is used and does not have a box. These are authenticated and 100% Authentic. Shipped with USPS Priority Mail. This is a Nike Air Foamposite Pro "Gym Green" in Good Condition. One of the anglets on one of the shoelaces is missing and the sole is yellow but the body is Flawless there are no scuffs or anything like that. NIKE AIR FOAMPOSITE ONE. COLOR CODE - LEGION GREEN / BLACK-BLACK. STYLE NO. 314996-301. 100% AUTHENTIC! SOLD OUT! IN GOOD PRE-OWNED/USED CONDITION. THEY ARE ABOUT 6 1/2" TALL. Condition: New without box. Style #: 624041-303. Nike Air Foamposite Pro are new, 100% authentic, and in their box with NO LID. They will ship double boxed. Feedback automatically left after you, thanks! Brand New Air Foamposite One Premium Size 8.5 never worn new in box. All my items are 100% authentic from manufacturer or authorized dealer. Foamposite Gym Green. 8/10 Condition (Style Code 624041302). Price negotiable within reason. Nike Air Foamposite Size 14 Turquoise/Teal/Green-Blue USED 100% AUTHENTIC. very difficult to find this beauty in this size, in this color, in this condition. They are used, so as always wear at your own risk. Gym Green Foamposite size 9.5. Dead Stock !!! Get em now !!! 100% authentic Please view all pics, slight yellowing to midsoles due to age. Sneakers are kept in a climate controlled environment, non smoking. No returns. Nike Air Foamposite Pro Gym Green 624041-302 Men’s Size 10. Shipped with USPS Priority Mail. Here we have a pair of the Nike Air Foamposite One "Olive". Foamposite One Olive Suede. RARE 2015 RELEASE! Style: 575420-200. Nike Foamposite Pro pine green. lightly worn. Condition is New without box. This shoe is very close to being brand new. The only defects on it is a very small scratch on the bottom of the shoe on the carbon fiber. There are also a few tiny specs of dirt/tiny rocks in the bottom. These shoes are practically Deadstock. Box comes without the lid. Message me with any questions! NIKE AIR FOAMPOSITE ONE "DENIM". COLOR CODE - OBSIDIAN / BLACK-UNIVERSITY RED. STYLE NO. 314996-404. 100% AUTHENTIC! LOW PRICE! Nike foamposite electric green. Condition is Pre-owned.